I've had a great run collecting Transformers but it's time to move on. After much contemplation, I've decided I want to finish off my collection with a piece so memorable, so truly special that it will be something worthy of the honor of being my very last Transformer. It will be a figure that when I look at it on the shelf I will cry because it embodies the emotional significance of the end of my Transformers journey. It will remind me forevermore of how wonderful my life was made over the past 31 years by Hasbro's special recipe of little robotic puzzle people made from plastic and metal and rubber. It will be the capstone of my Transformers collection and my rite of passage into a true manhood where I collect only old Macross models from Bandai. And so I have decided Masterpiece Ultra Magnus will be the very last Transformer I will ever buy. 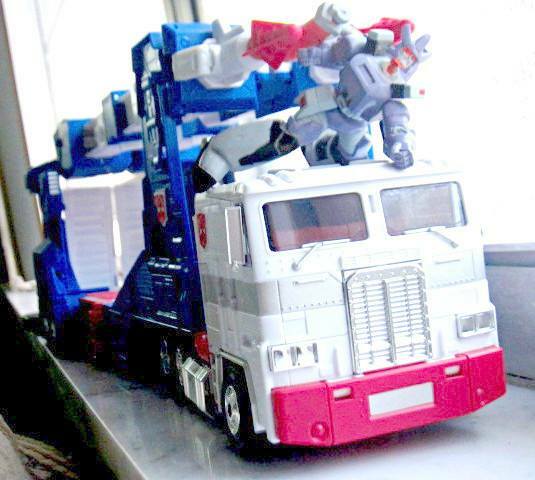 Ah, Ultra Magnus-I remember the first time I saw one back in '86. Actually it was a bunch of them. I was at a retail chain called Winn's. There was a stack of about four or five of them on the opposite end of the aisle from where the rest of the Transformers were. I guess they didn't know where to put this new guy. I was blown away because I'd never heard of the toy before and from looking at the box I couldn't figure out how they got that robot from that car carrier. I remember thinking Transformers were getting more and more interesting and there was no end in sight. So how fitting is it now that the ultimate version of the robot I felt signaled a gret new era of the Transformers franchise be the ultimate robot of my Transformers collecting experience. I'm as sure I'm done with Transformers as I am certain that that no better version of Ultra Magnus will ever be made. So that is why, with great pride and humility, I have decided Masterpiece Ultra Magnus is the very last Transformer I will ever buy.